In 1930 the Dominican Republic issued a set of 4 stamps with the same design with a map of the island of Hispaniola or Santo Domingo divided between Haiti and the Republic. The dotted line may represent the airmail route to the Dominican Republic. An airmail stamp showing air routes to the capital, Cuidad Trujillo, was issued in 1946. The same design appears on regular postal issues for the same year. Eighteen islands make up the Faroe Islands. 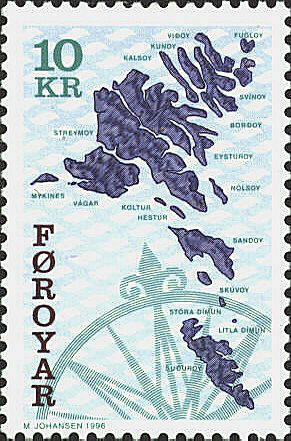 The largest is Streymoy; two of the smaller islands, Hestur and Mykines. Hestur, "the horse," lies three miles off the Southwest coast of Streymoy. 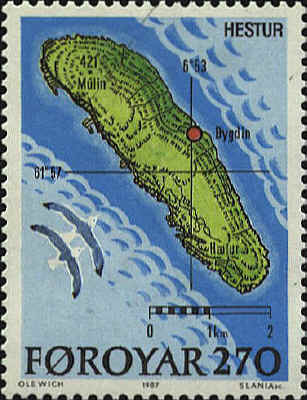 The map identifies Múlin, one of the highest points rising to 421 meters, Hælur, a lighthouse on the southern tip of the island, and Bygdin or village is also called Hestur. There are about 60 inhabitants on the island. The main occupation is fishing. Mykines is the westernmost of the Faroe Islands. It is unlike the other islands. Some believe that it is the "paradise of the birds" described by St. Brendan in the sixth century. Puffins, called "diving parrots" in German, or "little friars" in Spanish abound. Knúkur is the highest point, 560 meters. The Bygdin has earthen streets, bright turf-roofed houses, and a white, turf-roofed church. About fifteen people live in the village. Legend says that St. Brendan and his monks passed the islands in the sixth century. The Norse arrived in the ninth century. Christianity became the religion around 1000, and in 1035 the islands became a part of the Kingdom of Norway. in 1849 Denmark officially incorporated the Faroes. 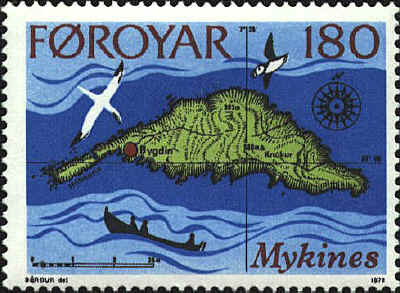 Following World War II the Act on Faroese Home Rule was passed and the status of the Islands was changed from county of Denmark" to "self-governing community within the Kingdom of Denmark."